A rapid increase in the cases of glaucoma, a serious eye disease has called to create its awareness worldwide. This initiative has been actively taken by the National Eye Institute, to make people aware of the facts about glaucoma as early detection is the key factor to avoid and prevent the growth of this major eye health concern. Glaucoma is referred to the group of diseases which can damage the optic nerves that work as the data cable to carry visual information for the brain. With the growth of glaucoma, disruption in this visual transformation of images happens, resulting in low vision and even blindness may occur if immediate treatment is not given to the patient. It is also known as “sneak thief of sight” because in most of the cases it remains undetected and causes permanent damages to the eye which cannot be cured. Increased eye pressure is the primary reason for developing glaucoma but it doesn’t mean everyone with increased eye pressure will develop this eye issue. Glaucoma can happen to anyone and after the age, 40 people are more at risk to develop this eye health concern. So it is very important whether you have any issue or not, go for eye check-up at least once in a year after the age 40 to 45 years as early stage detection can reduce its severity and can be relieved with appropriate treatment. One important fact regarding glaucoma disease which everyone should be aware of and that is once your optic nerve is damaged by glaucoma the lost vision cannot be restored with any treatment. So early detection is the only relief factor to prevent the progression of glaucoma eye disease. In most of the cases, glaucoma doesn’t develop any symptoms, especially in its initial phase. With the progression of the disease, vision gets blurry and fluctuating. This is the reason many people who have already developed this eye issue don’t even aware of its existence. So it is very important to go for thorough eye check-up at least once in a year to an eye specialist as if it is caught in the initial stage it can be relieved with proper treatment, otherwise if left untreated for a long time it can cause hallow vision and then total blindness. Glaucoma is divided into two primary forms as per its type and consequences. First one is open or wide angle glaucoma which is a very common one and often not develops with any kind of sign or symptom. Out of 10 glaucoma patients, 9 are detected with this type of glaucoma. The open or wide angle glaucoma occurs due to partial or ineffective emptying of eye fluid without any obstruction in eye angle. 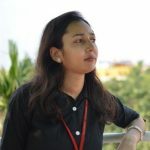 In this case, there will be no sign until it develops in the full-fledged form that is why it is also known as “silent thief of sight ” as it can cause irreversible damages to the eye which makes it a chronic eye disease. The second type of glaucoma which appears in a very rare case or less common than the open angle glaucoma is known as close or narrow-angle glaucoma. This kind of glaucoma occurs when some obstacles block the angle causing infrequent or unsmooth fluid flow in the meshwork. If anyone experiences any of the above symptoms then they should seek immediate medical care without delay otherwise it can cause complete vision loss. When fluid existing in your eyes accumulates unusually it puts extra pressure which is difficult for eyes to manage as canal which works as a drainage system for clearing this fluid get blocked or plugged which hinders normal drainage resulting in Glaucoma develops. In some cases eyes started producing more than normal fluid which becomes hard to get drained at fast speed resulting in more intraocular pressure appear causing glaucoma. 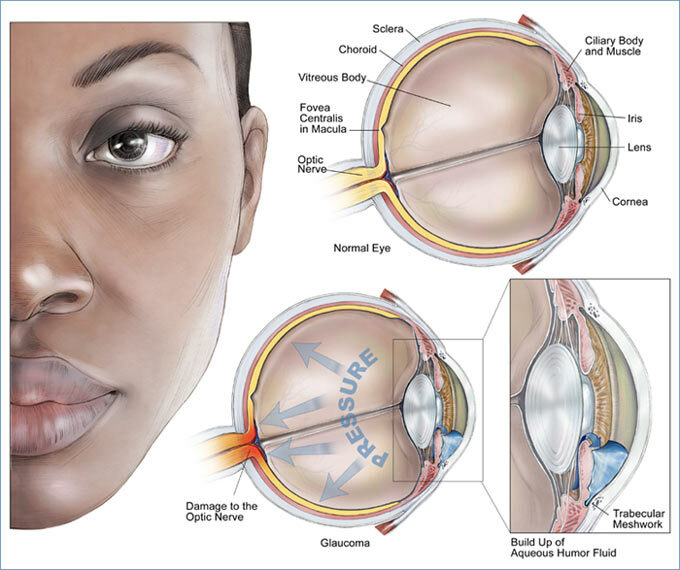 However, as of date, there is no particular reason or excuse behind this excess fluid production in eyes. Some kind of trauma or injury in eyes which puts extra pressure on eyes may end up with glaucoma issue in eyes. The optic nerve which is responsible for the eyesight if receives a lesser amount of blood flow due to any reason then it can cause to develop glaucoma problem. A genetic disorder can be one vital reason for causing glaucoma in eyes. Following factors increases the risk of developing glaucoma which is a leading eye health concern worldwide. Certain eye problem increases the unnecessary pressure in eyes which is a primary reason for the growth of glaucoma. Chronic inflammation in eyes, trauma or injury in the eye and thin corneas concerns are some common problems which can lead to creating extra eye pressure. People with some special health concerns such as diabetes, high blood pressure, and heart diseases have a greater risk of developing glaucoma in the future. Taking some special medications increases the risk of glaucoma growth in future like using corticosteroids for a very long period contains the risk of developing secondary glaucoma. People belonging to especial ethnicity or race are more likely to develop glaucoma. Like people belonging to African or African-Americans descent have a greater risk to develop glaucoma in their lifetime. Likewise, Japanese people have a risk of developing low-tension glaucoma whereas Asian people have a greater risk of developing angle-closure glaucoma. Age plays a vital role in the growth of glaucoma a serious eye disease. People aging 60 or more have a higher risk of glaucoma as per the report of NEI and this risk factor keeps on increasing every year along with increasing age. However in the cases of African-American descent this risk increases by the age of 40 only. The previous or old family history of glaucoma eye disease impacts a lot to the next generation by keeping them at risk of developing the same kind of glaucoma that their parents and grandparents have developed in their life. Like it is seen in many cases that if the parent or grandparent of any person has suffered from open-angle glaucoma then their children or grandchildren remain at risk to develop a similar type of glaucoma in their life. An eye specialist will do a thorough checkup of your eyes for clearly detecting the intensity of vision loss and any possible optic nerve-damaging before starting the treatment. In order to detect glaucoma ophthalmologist will conduct the following diagnostic procedures. Tonometry: Tonometry is the vital diagnosis test of glaucoma in which a tonometer will measure your eye pressure or intraocular pressure. Perimetry Test: Perimetry test is also known as the visual field test which is conducted to diagnose whether glaucoma is hampering your vision or not. This test is conducted by measuring peripheral, side vision and central vision. Pachymetry Test: The pachymetry test is conducted to measure the thickness of your cornea as because the thin cornea than the average size is one of the primary factors for developing glaucoma. Gonioscopy: Gonioscopy test is performed to detect the angle of the eyes means whether it is open or closed. Optic Nerve Monitoring: Your doctor may monitor your optic nerve if he finds it is necessary for detecting any damage has occurred in the optic nerve or not due to glaucoma. Under the condition, any damage is suspected then thorough scanning of the nerve fiber layer and measurement of overall visual field will be done to analyze the range of damage. Complete Medical History Detailing: The ophthalmologist will ask your complete medical history as this helps them to analyze your eye condition and the risk factor for developing glaucoma. In this context, your doctor will ask about the signs or symptoms that you are facing. Also, they will ask about any previous history of glaucoma in the family or any other health concern currently you are suffering from to analyze whether any other health issue is impacting your eye health or not. Eye specialist or the ophthalmologist will diagnose your eyes current state and as per the intensity of glaucoma, they will prescribe for medicated eye drops to relieve the pressure on eyes. This eye drop will work in two methods, either it will increase the outflow of fluid or lowers the formation of fluid in order to reduce the eye pressure. However, eye drops and other medications may cause some side effects too such as redness, allergies, stinging, irritation, and blurred vision. Also if you are already taking some other medications or suffering from any kind of allergy then don’t forget to share this with your doctor before they prescribe any medication to you. In certain cases, glaucoma medications may cause to affect your heart and lungs. So always asks for associated side effects to your doctor before using any glaucoma medication. Microsurgery is also known as Trabeculectomy in which doctors prepare a new channel for the obstacle-free fluid drainage so that the eye pressure can be reduced and glaucoma condition can be controlled. In this form of surgery, the eye surgeon might implant a tube for the fluid drainage. However, the drawback of microsurgery lies in the fact that in some cases this glaucoma surgery fails to treat glaucoma and needs re-surgery. Also, this surgery can cause bleeding and infection and in some cases, it can cause temporary or permanent vision loss. Iridotomy- In this procedure, a small hole is created in the iris so that fluid can flow easily and freely. Cyclophotocoagulation- In this process fluid production is reduced by treating the middle section or layer of an eye for reducing eye pressure. For treating open or wide glaucoma doctors often use a combination of treatment including eye drop, microsurgery, and laser trabeculoplasty. In countries like US doctors mostly prefers to start glaucoma treatment with eye drops however as per the success rate of glaucoma treatment concerned it is seen that in most of the successful treatment of glaucoma early stage microsurgery or laser surgery have worked very fast and positively. In the cases of the infant or congenital glaucoma where affected person is born with a birth eye defect, surgery is considered as the first and effective method of treatment as because in these cases drainage system of the eye remains already distorted or damaged. However, it is always advisable to consult with your doctor regarding the appropriate treatment method or best treatment option for your glaucoma eye issue. The simple answer to this question is “No”. Just like other health issues, you cannot prevent glaucoma but yes with some smart measures its progression and the worst effects generated out of full-fledged glaucoma that is a loss of vision or total blindness can be prevented. A yearly routine of thorough eye checkup at least once in a year is the key to prevent the growth or progression of glaucoma in severe form by detecting the range of eye damages caused by glaucoma and staring its treatment on time. Like most people after the age 40 fall in the risk of developing glaucoma eye disease so at least in the interval of 2 to 3 years people aging 40 or above should go for complete eye checkup to an ophthalmologist. After 60 the risk factor of glaucoma growth remains twice so people of this age should go for yearly thorough eye checkup routine. Any physical injury or trauma in eyes can cause immense pressure on eyes leading to glaucoma diseases in future. So it is very important that everyone should take care of their eye’s protection. This is very crucial in the cases of sportsperson, or any other professionals where eye injury risk involved to a great extent. Just like other body parts exercise tones and boost your physical health similarly performing eye exercises can help a lot for improving eyesight and will also protect it from the risk of developing glaucoma by reducing eye pressure. At last, we must say that awareness is the key to avoid any kind of health trauma and same is applicable to glaucoma eye disease too which is the most dangerous eye health concern. 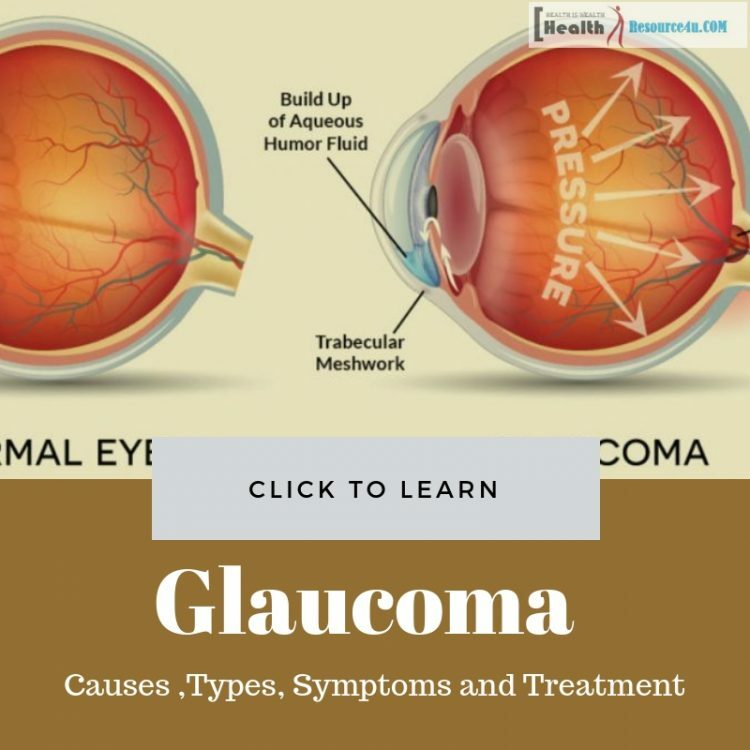 The facts about glaucoma mentioned above reveal the complete picture and consequences of glaucoma that everyone needs to know.